The former James L. Varick Community Center at 151 W. 136th St.
HARLEM— Neighbors suspicious that the city has revived plans to turn a shuttered community center on West 136th Street into a homeless shelter are girding for war — saying a residential block filled with two schools and a library is no place for the facility. 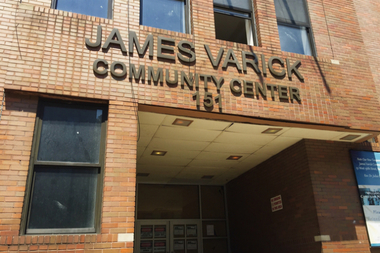 Last year, community members rallied against the plan to convert the James L. Varick Community Center at 151 W. 136th St. into a shelter, claiming they were double-crossed by developer David Levitan, who was planning to move in the shelter in instead of high-end apartments promised for the site. Residents thought the plan was quashed when the shelter provider, The Center for Urban Community Service, pulled out of the plan. However, West 136 Street Block Association member Amy Zink said she encountered three Department of Homeless Service inspectors assessing the property two weeks ago. “They said they were there to inspect the facility and said at this point they don’t see it being stopped,” she said. Zink said she was stunned and was dismayed at the lack of transparency from the city when the community has been consistently opposed to a shelter being placed on the block. She added that the block association is considering hiring an attorney. DNAinfo New York inquired about the shelter to DHS and the mayor's office. A spokesman for the Human Resources Administration, which has been tasked with overseeing city shelters, replied on those agencies' behalf and would not confirm or deny the plans. “Communities will be the first to know as new locations are selected,” said HRA spokesman Issac McGinn. The community center, which was formerly owned by Harlem’s historic Mother AME Zion Church, sold to Levitan in 2015 after previously being used by local youths for “community enrichment” activities, the block association said. The association is not opposed to having supportive services for those in need, but believes Harlem already is over-burdened with shelters and other supportive services. Members want other communities to bear some of the load, citing the city’s “fair share” criteria, which states there must be an “equitable distribution of public facilities throughout the city." “It disrupts not only the fabric of our block but the entire neighborhood,” said block association president Peter Marchese. “It’s a residential block that has a public library that includes a children’s library and a research library — the Schomburg — and Harlem Hospital is at the end of the block and two schools at the end of the block." The association also said the city and the developer have run afoul of moratorium on homeless shelters and other kids of supportive services like methadone clinics drawn up by Community Board 10, which covers the area. “It’s shame to see our neighborhood to be taken for granted and just another place for the city to dump what the city doesn’t want,” Marchese said.